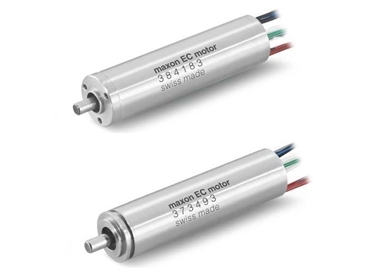 Maxon Motor Australia is the supplier of high-quality motors fitted with powerful permanent magnets. Their new 50 Watt EC motor is based on the same design as the 30 Watt motor and uses identical components. It is characterised by its high nominal speed, low noise and low vibration operation. The drives are suitable for the use in electric powered, weight and size optimised surgical power tools. Attention has been set on lowest possible heat generation. The 50 Watt motor is 11mm longer (total length 50mm) and delivers 50% more torque. It may be applied where the smaller motor’s power is not sufficient. Size 5 variant: Dimensions in U.S. Customary Units (outside diameter Ø½ inch, shaft Ø0.125 inch). Fixation by means of Servo Mount, a well-established type of motor fixation. 13mm variant: Dimensions in metric units (outside diameter Ø13 mm, shaft Ø3 mm). Fixation by means of flange with 3 face-side threads. The gearheads GP Size 5 M and GP 13 M can be combined as well. Typically, the drives withstand 500 steam sterilising cycles. During internal tests, the drives have been tested for up to 1000 sterilising cycles. Thereby, all motors surpassed 500 cycles. During the sterilising tests, isolated cases of increased vibration and noise could be observed, nevertheless on an uncritical level. The other motor data remained the same. Depending on sterilisation method and quality of the employed appliances, the number of cycles can quite deviate. The drive has particularly been designed for the use in electric driven medical power tools. The targeted service life is 100 hours which typically corresponds to 500 surgeries of 12 minutes.